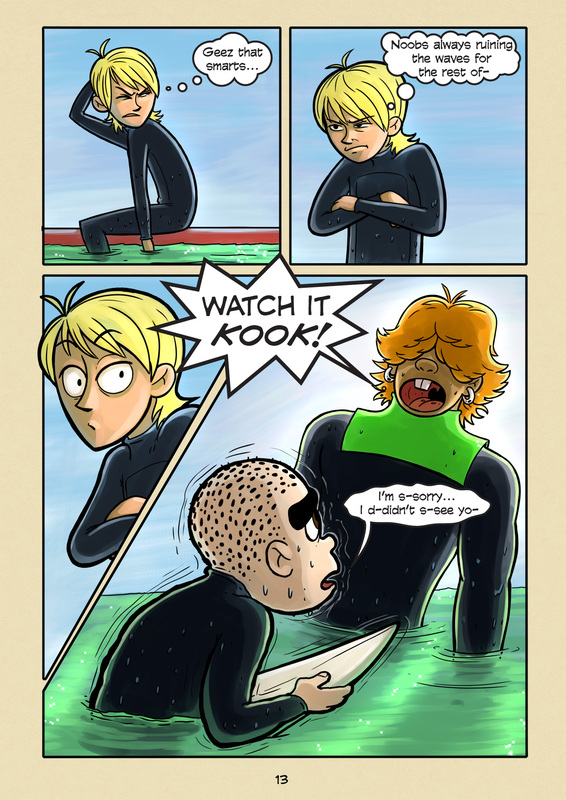 That Smarts (#013) | Web comic "Surfer Joe"
That smarts… such a funny term. I’m not sure where it comes from and honestly I’m too lazy to look it up so I’ll just take a stab at it here. I assume when you do something ill advised that ends in pain, the pain is educational in the sense that you learn not to try the “ill advised” thing again. Thus “smarts”… yes? no? I don’t know but it makes sense to me, so I’m sticking with this definition. Dictionaries and the internet be damned. What doesn’t kill you makes you smarter. There is a lot of forces moving in the ocean. Waves move pretty quickly and the push a lot of water, even on the smaller ones. So when you collide with another surfer or make contact with your board, chances are you are in for a hurting. Pain is a part of life unfortunately, and the prospect of pain and consequence is so apparent in the sport of surfing. It’s in your face, and you have to accept it. This is a key to becoming a competent surfer. If you cannot except it, you cannot equip yourself mentally for the inevitability that you will get hurt. Without this acceptance you cannot move freely, and you cannot commit to waves. And without commitment then you are just bobbing in the ocean, at the mercy of your surroundings. The truth is, people are afraid of commitment because they are afraid of the prospect of pain. But pain happens regardless. The problem is pain from passivity doesn’t “smarts”, it just hurts.